Live Processes let process owners build and launch simple process applications created with no coding, as described at Live Processes. This section describes how to get started by designing and publishing a process through the Live Processes feature. The chain of activities is the fundamental structure of the process. Elements (tasks, gateways, etc) are included in accordance with process' requirements. Design the user interface with the information that will be displayed in the activities of the process. Using the Forms Designer, you can have an intuitive and user-friendly structure to drag and drop the Bizagi Controls into a form and arrange them for best usability. 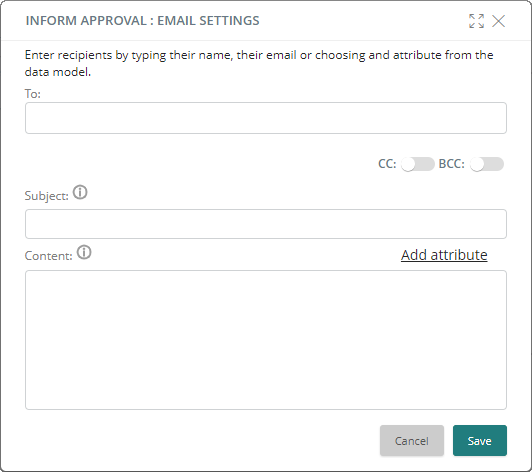 Compose the email notification messages and assign their recipients. Define conditional flows to model business behaviors. Determine the path that must be followed by the process flow when it reaches a Gateway. Assign users to carry out activities in processes. Each Task created for an end user requires a definition that lets Bizagi allocate the correct users within your organization. Activities are displayed in each user's Inbox. 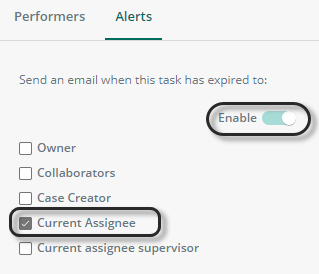 Choose which users receive an email notification when a task expires. Make your process available to end users after having ensured the process behaves as expected. 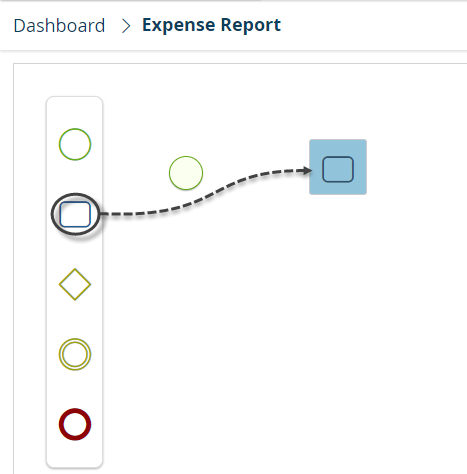 Consider an Expenses Report process with Live Processes. 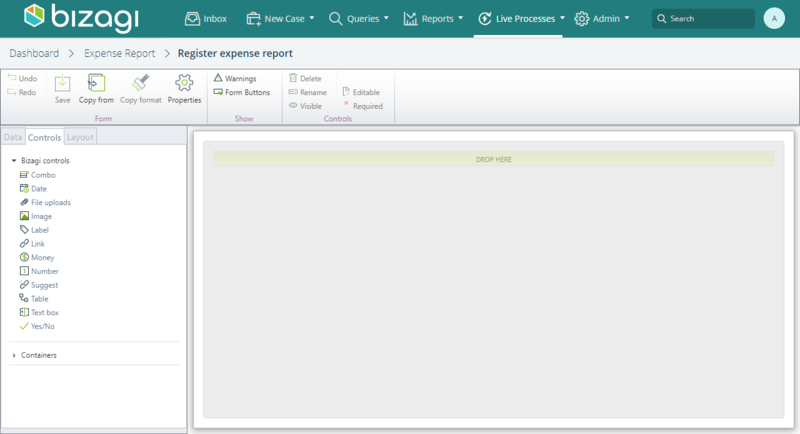 In this example, an employee registers their expenses from a business trip. When the amount of expenses exceeds $100USD, an approval is required, and for each report, validation of the policies defined by the company has to be performed. You can rely on Live Processes for non-complex processes. To view supported features and consider the potential of this feature, refer to Guidelines when using Live Processes. To produce a Live Process to match the model, follow these steps. In the Work Portal's Ribbon find the Live Processes option. This option has a menu where you can choose whether to manage your existing Live Processes or create a new one. Select New Live Process. Provide the desired name for your process and click Create. Once you create the process, the Drawing Area displays where you can model the process. 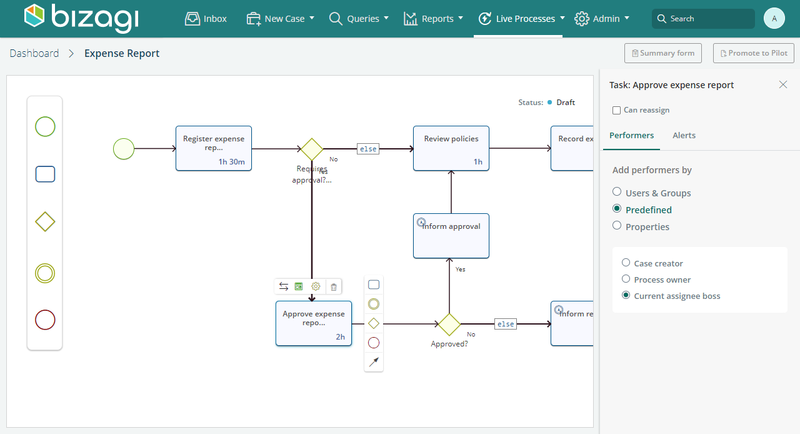 It is quick and easy to create Process diagrams in Bizagi Work Portal. Just drag and drop the elements you want from the Palette or from the Pie Menu. We describe the elements that appear in the Palette and the Pie Menu. 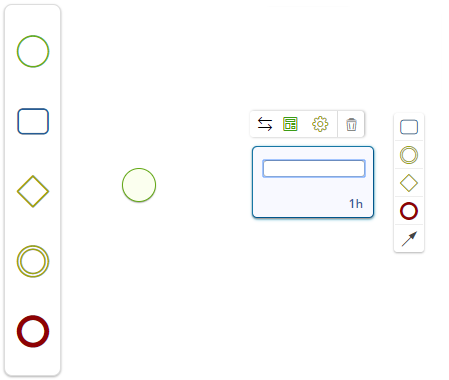 Once place an element on the Drawing Area, the element is editable. You can set its display name and the Palette for the element appears. 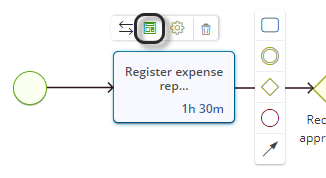 To edit a task's name or estimated duration, double-click on it. Bizagi interprets the unit you type as minutes, unless you specify it's hours by typing an "h". If the number you type is greater than 60, Bizagi automatically display it as hours and minutes. Connect the elements using the Flow Sequence tool located in the Pie Menu. 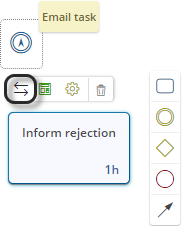 Drag and drop the arrow into the element you want to connect. Elements dragged from the Pie Menu will be automatically connected. If you need to change between an exclusive gateway and a parallel gateway, click the icon in the Pie Menu and choose the desired shape. Likewise, you can change your tasks into Email Tasks. Click the icon in the Pie Menu and choose the desired shape. The second step is to define the forms where end users interact with the process. Forms are available in User tasks and in Intermediate Events. 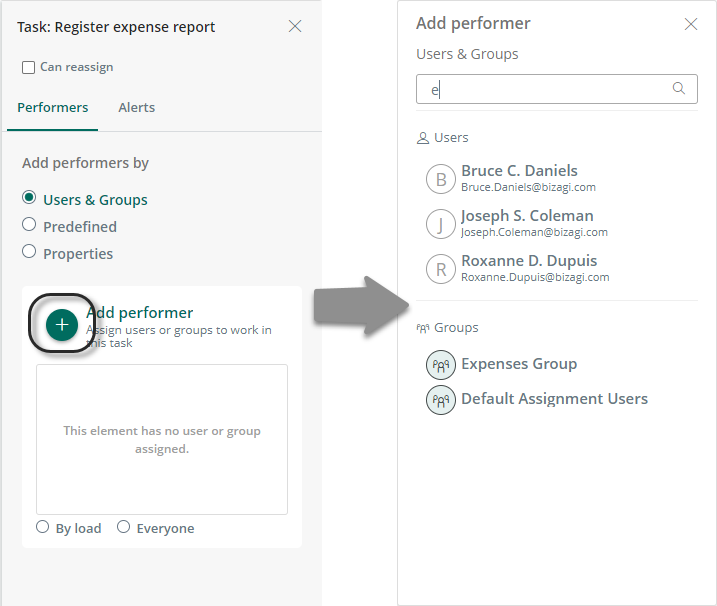 To perform this step, Bizagi uses a Forms Designer that with a what-you-see-is-what-you-get (WYSIWYG) interface, meaning that you can build a form and see exactly how it will display to end users. All controls included in a Form can be reused within the same process, since a data model is created. 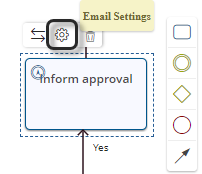 Click the activity where you want to create the Form, select the Form Designer icon in the Pie Menu. The Forms Designer displays. 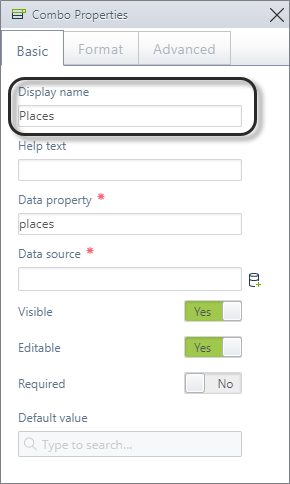 If there is no Form previously built, the Forms Designer shows a blank display area. In the Controls tab on the left panel are controls you can drag and drop into your Form. You can also double-click the control you want to add. Each control you include is saved in the process's data model and is available for all other User tasks and Intermediate Events within the same Live process. In the Layout tab you can find Tabs, groups and Layouts that help you achieve the desired look and feel of the Form. Give each control display name before saving it. To change the display name double-click the control's label on the form, or select the control and set its display name in the control's properties. When all controls you need in the Form, click Save. 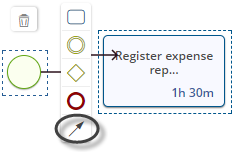 You can define a Summary Form which displays when the case is finished or when a process is searched and there are no pending activities for the user, by clicking on the Summary Form button located at the top right corner of the Drawing Area dashboard. Live Processes lets you add Email Tasks to notify people as the process moves on. In our case, the task "Inform rejection" can be set to notify, that is, send an email. Once we've set our task as an Email Task, compose the notification message. To do so, click the Email settings icon in the Pie Menu. A pop up window appears where you can configure who receives the email, set the subject line, and add content. Furthermore, you can include recipients in Carbon copy (CC) and Blind Carbon Copy (BCC) fields by toggling their respective switches. You can message recipients from Bizagi's suggestions, or you can enter them manually in the field provided. This field accepts emails and system users. Inserts the case creator's name. When modeling the Process, include the routing rules that will help determining the path the process flow follows when reaching a Gateway. Select the path to be defined as Default Path and, click the Else icon. Once you have defined the default path, Bizagi shows the flow with an 'else' tag. Next, select the path where Bizagi will evaluate a set of conditions. Click the Add Expression icon. Click Add expression to create a condition. Click it again whenever you want to add a condition to the set. Provide the process attribute (defined in the Forms step) and build the condition according to your Business needs. In our case, the request has to be approved when the Total Amount exceeds $100USD. Click Save and repeat the previous steps for the Gateway. Define the work allocation for each Activity of your Process. Performers are the end users allocated to execute each Activity. Each Activity needs a performer definition so Bizagi can allocate it correctly to the defined user in your organization. Allocations are enabled for User tasks and None Events. 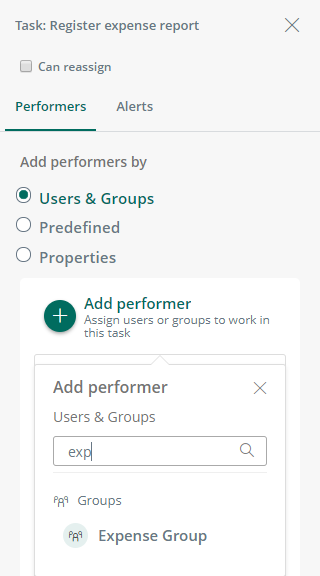 Click the activity where you want to configure the assigned user then, select the Settings icon located in the Pie Menu and go to the Performers configuration. This option lets you select a user or a group of users in your project. Users are named users available and created in the project. •Those created manually by users on the Work Portal. For more information on manually created groups, refer to Managing User Groups. •By Load: The Activity is allocated to the user with the lightest workload or with the fewest “jobs pending” on the project. However, the system first checks whether anyone in the user's group has already worked on the case. If so, they are assigned the Task, regardless of the user's workload compared to the rest of the group. •Everyone: Allocations are given to all users who meet the condition below. The first person to take ownership of the case (i.e., click it in the pending Inbox and then click take ownership option) is assigned to perform the task; consequently, it is no longer displayed for the others to see. 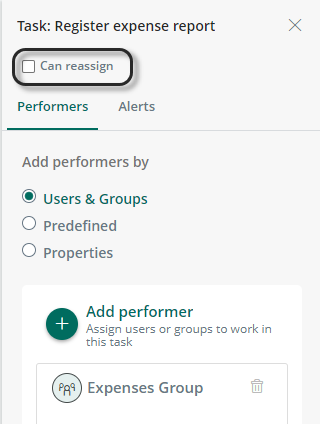 If the person who was assigned to perform the task releases it, it becomes available again to all users who match the assignment rules. Select the criteria: click the icon. To allocate a User, provide the name of the user (previously created in the Work Portal) in the search bar to assign them to this task. Select their username. In our case, the Register Expense Report task is performed by user Bonnie Duff (username bduff). For Groups, provide the name of the group and select it. To delete a user or a group from your performers list, click the trash icon by their name. The selected condition displays a confirmation mark ( ) next to its name. Make sure you the mark belongs to your chosen option. When moving between tabs, the option changes as well. Live Processes will take the marked condition. Once you're done setting allocating work, you can set up alarms for each task individually. To do so, click the Settings icon on the Pie Menu, and then click the Alarms tab. On this menu you can choose who receives an email notification when the task expires and whether or not this alarm is enabled. To enable the alarm, click the Enable switch and check the users to whom the notification will be delivered. 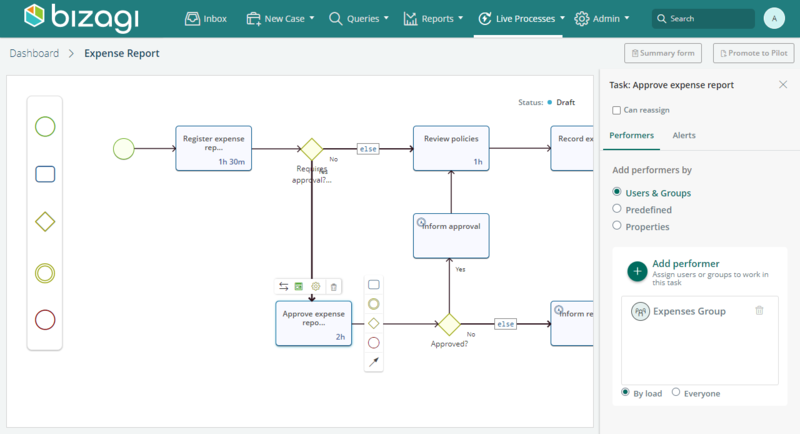 Just as you can do with a process diagrammed in Bizagi Studio, Live Processes can be configured to allow a task or event to be reassigned to another user. To enable or disable this option you have to select (or deselected) the Can reassign checkbox for every task or event. If you leave the checkbox selected, and the case comes to that activity, users with administration privileges are able to assign the activity to a different user. For more information about this, refer to Work reassignment. When your process is ready and you have thoroughly validated that it behaves as expected, you can publish it in your Work Portal from the Manage Live Process dashboard if you are the process owner. Follow the details provided at publish to release your new process for your end users can start working with it.